Join us for a hands on, fully coached bicycle maintenance workshop. Intro – you can do 90% of bike maintenance yourself! Cleaning and lubing chain, edge of jockey wheels etc. Taking off a tyre and changing a tube easily. Note, kids under 16 can attend with an adult for free, with their own bike included, as long as they are supervised and work together with the adult. 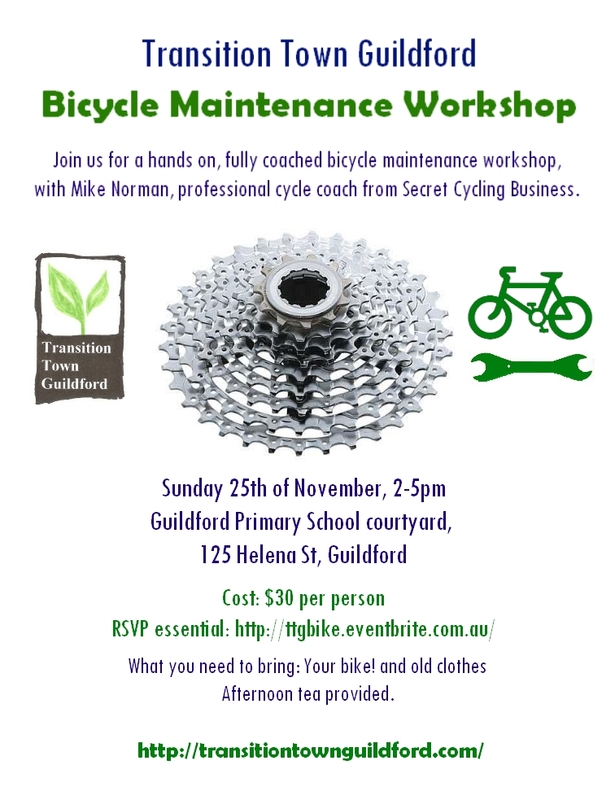 The workshop will be run by Mike Norman, professional cycle coach from the Secret Cycling Business. He will demonstrate each step and then participants get to work on their own bikes with assistance. This entry was posted in Event, Transport and tagged bicycle maintenance, Cycling, Guildford Primary, Workshop. Bookmark the permalink.